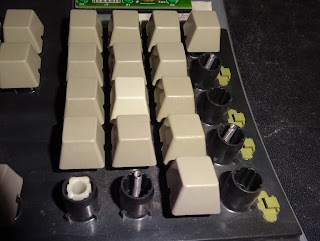 I've been asked a few times recently about the IBM Model M keyboard I use, so here are some photos I took when I restored it. I use this daily as my main keyboard, seen here with my other favourite and slightly out of date input device, the Microsoft Wheel Mouse Optical. I'd be very reluctant to change either of those. It looks very nice now, almost like new, but that's not how it looked when it arrived. It wasn't a very promising start, but it appeared basically intact. 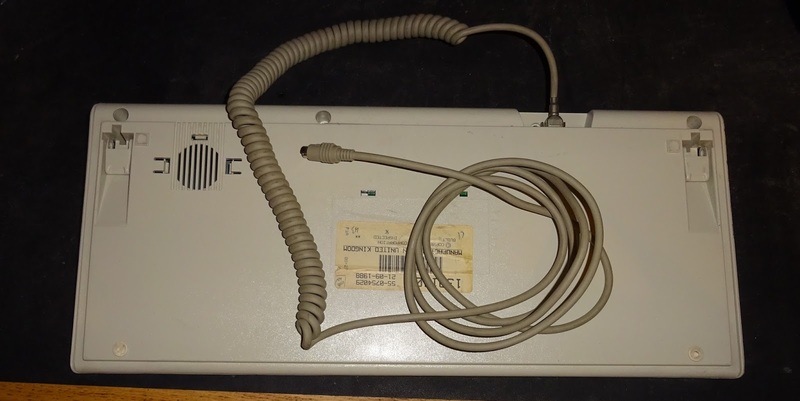 There was one key missing (the number 1 on the top row), and no cable - the cable on the Model M was detachable, and this one had been detached and lost or sold separately. It also needed a serious clean. You could probably work out the previous owners password from looking at the clean keys. 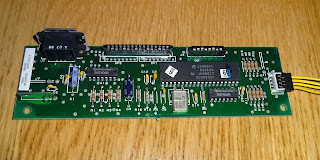 I stripped it down to clean it and looked around for the missing parts. 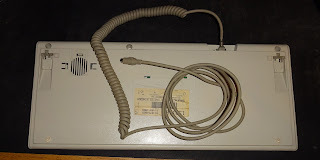 I found a cable, but when I tried the keyboard, it didn't work. 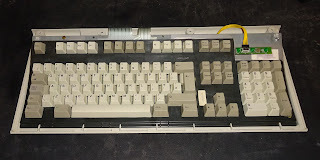 It powered on correctly, the caps lock, scroll lock and num lock LEDs flashed on, and then off, and they could be toggled using the appropriate keys, so all looked promising. However, as soon as the PC booted, it stopped responding, the LEDs no longer changed and nothing was sent to the PC. I checked continuity and the cable was fine, so I suspect this was due to the 7406 buffer on either the clock or data line. 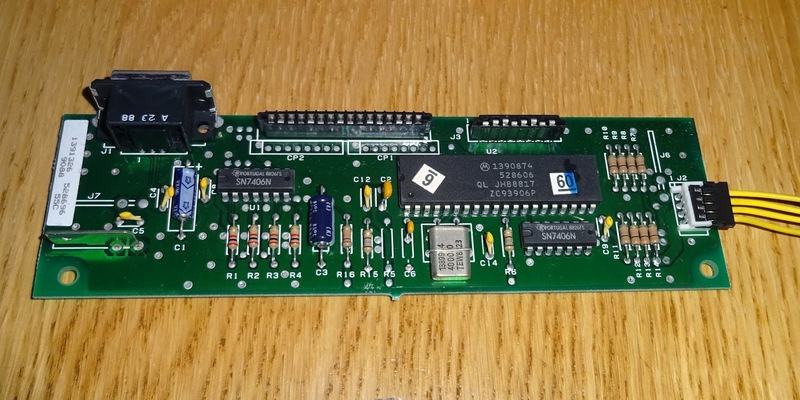 I did considered making a USB keyboard controller to fit in place of this board. 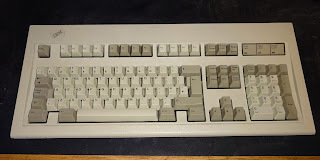 Before I got around to fixing or replacing it, a second Model M arrived. I had found this one when looking for replacement keys. This one had been described as incomplete, not working and for parts. It was missing several keys, the cable and the screws. 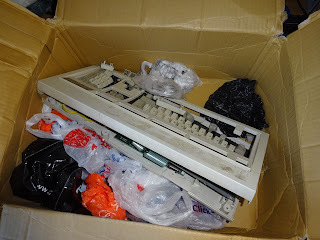 I guessed it was the remaining bits after someone had made one good keyboard out of bits of two. I don't know how bad it was before it was posted, but it was much worse when it got here. It arrived worse for wear, having been badly packed and then thrown about by the courier. 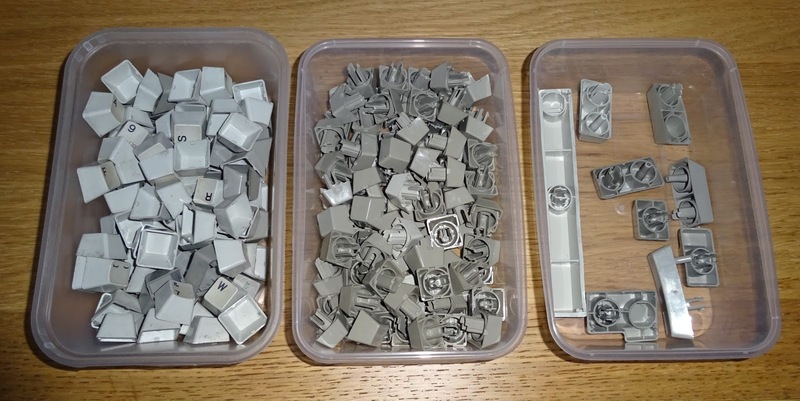 Many of the keys were loose in the bottom, and some had fallen out of gaps in the box, thankfully the one keycap I needed was still present. 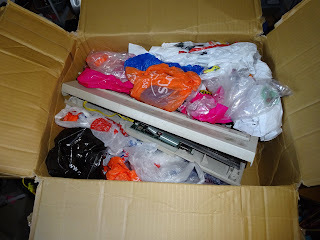 If the seller had actually put the keyboard on one of these bags I might not have lost the keycaps. I don't think anyone would package one like this today, at 5p per bag, there was about £1 worth of bags in there. 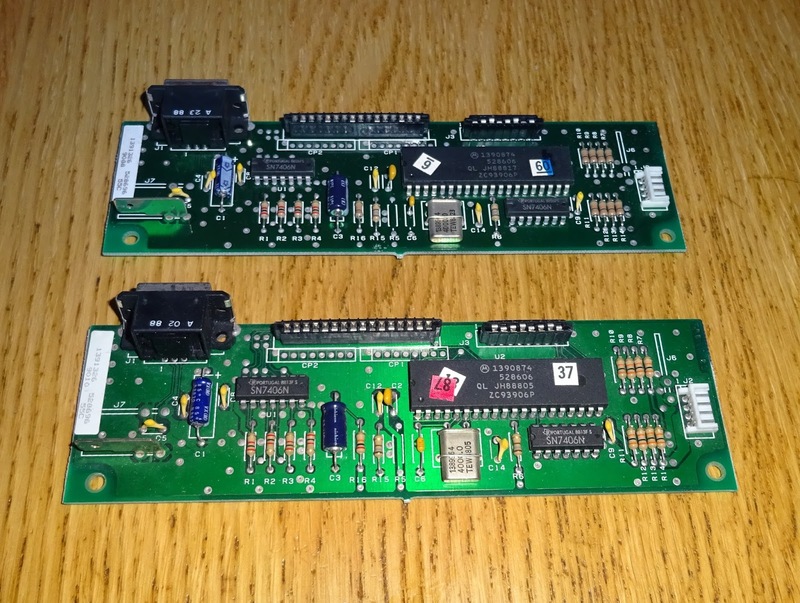 When I tested it, not all the keys worked, but most did, so I could conclude the controller board was probably OK. The problem in this case was due to the Achilles heel of the Model M, the plastic rivets that hold the backplate on. These can snap off, and many had, maybe made worse in transit. These are worth repairing, you drill them out and bolt the two halves together. Some of the springs were damaged or missing, so it's going need a bit of work. However, I now had a working controller and a full set of key caps. Putting those together with the original keyboard and the cable, I had enough bits for a complete keyboard. Time to put it back together. 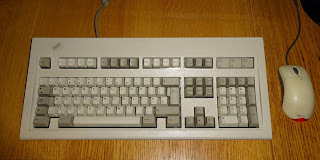 The model M has quite a unique construction, and is what makes it such a nice keyboard to type on. The keys use a buckling spring, when the key is pressed down so far, the spring buckles and forces down the plunger onto the membrane below, giving clear tactile feedback and making a clicking sound. The sort of haptics they try to recreate today on touchscreens. Yes, it is just a membrane keyboard, but the springs are the secret of it's success. Most of the keys are an unusual two part construction, a blank key with a little cap that clips over the top. I suppose that made it easier to product regional variations? 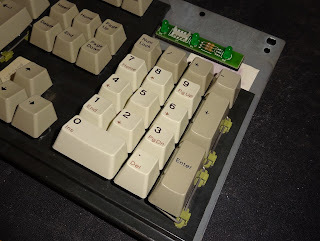 The larger keys are solid parts, with either have a dummy plunger on one side (the white insert on the bottom left), or a metal bar support (fitting into the green clips on the right). Having restored many types of keyboard over the years, these bars are often used on space bars and can be very fiddly to fit. These ones just slide in really easily, a very nice design. 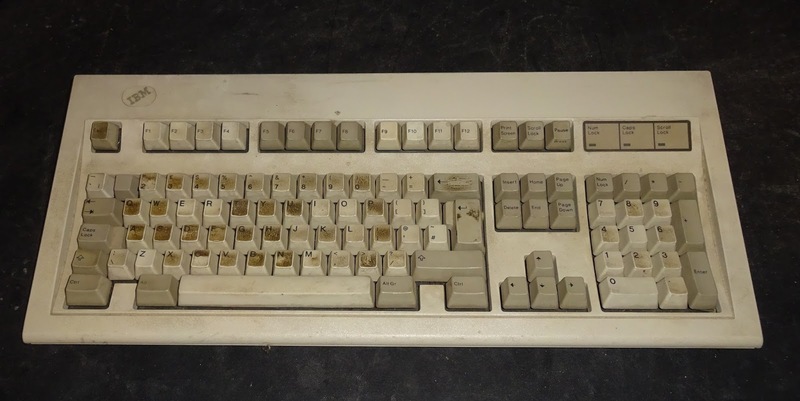 This one had metal bars on the Enter key, and the numeric keypad + and Enter. 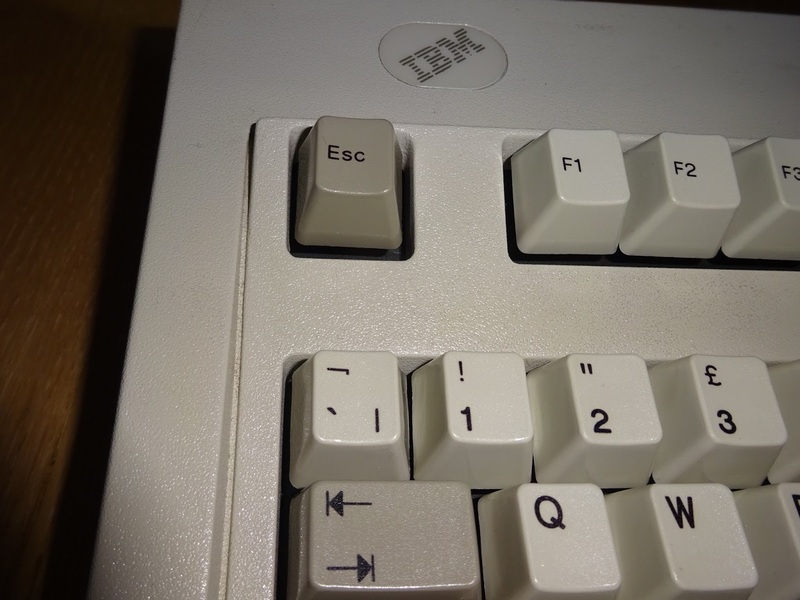 The second keyboard was the same, but the keycap for numeric keypad enter it came with didn't have a bar, that seems to have come from a third keyboard which had the white insert on Enter, like on the 0 key. This supports the previous assumption it was the bits left over from a merger. The white key in the centre of the numeric keypad may look wrong, and I initially thought it was, and was going to replace it was a grey one from the other keyboard. But I think it is meant to be like that. The F and J keys are also white. These are the three keys that have a slightly raised bar at the bottom of the keycap to aid locating your fingers when touch typing. 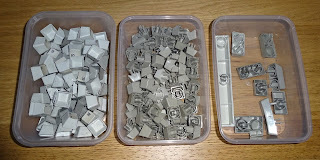 These are also useful when putting back the keycaps as you can locate the key in relation to F or J rather than having to count from the edges. 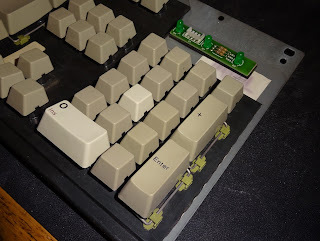 With all the keys replaced, the keyboard slides into the base board. Nice solid plastic, just needed a good clean. The controller fits into a slot in the base, the with the LED board and earth strap connected to it. Earth strap! how many keyboards these days have an earth strap, or indeed a large lump of metal that would need earthing. They really don't make them like this any more. The cover, again, just needed a good clean. It bolts together with unusual hex head bolts, a bit like the original IBM PC. Finally clip in the keyboard cable, coiled of course. 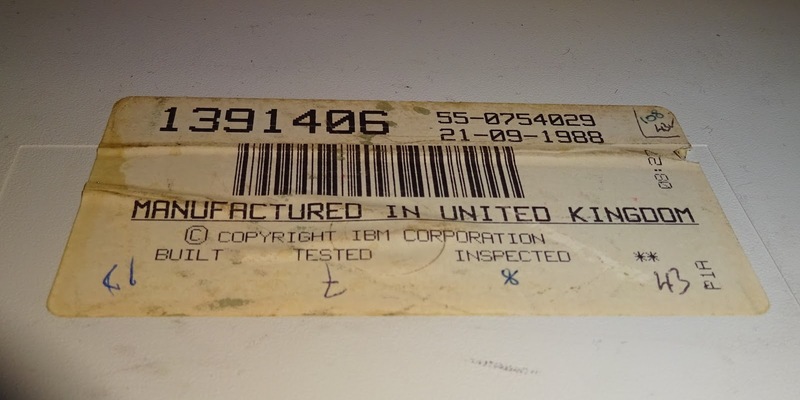 These came in various versions, an RJ45 for some industrial terminals, I think there was a 5 pin DIN for older computers, but this would have come with an IBM PS/2 computer. That range of computers introduced the new 6 pin mini DIN PS/2 keyboard and mouse connectors. These are still used today, there is still a PS/2 port on my main PC, even though it was built more than a quarter of a century after the keyboard. The same is true of the keyboard layout. This keyboard introduced what is still pretty much the standard layout today. The only thing missing is the Windows key, which was slotted in between Ctrl and Alt later on. Other than that, the mapping is exactly as it should be. 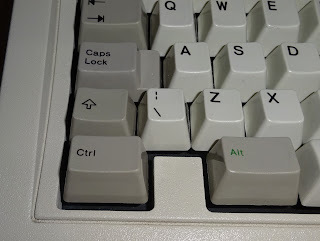 I have the right Alt key (marked Alt Gr here) mapped as the Windows key, as I use shortcuts like Windows + E to open explorer, Windows + L to lock the screen etc. I've also got the Pause/Break key mapped as the pause button on my mp3 player (good old Winamp). The only anomaly I have found is the key on the top left is labelled `¬| and the key between Z and Shift is marked \¦. On a modern keyboard they would be `¬¦ and \| . It seems the pipe and broken bar ( | and ¦ ) have changed place at some point. The keys act as you would expect on a modern keyboard, shift \ gives | which is fine by me. The pipe character | is used in many programming languages and on the linux command line. I'm not sure I've ever used the broken bar ¦ other than in writing this paragraph. I suppose you could use it to make an ASCII art picture of the strain relief on a DIN plug |¦|¦|¦|¦| ? 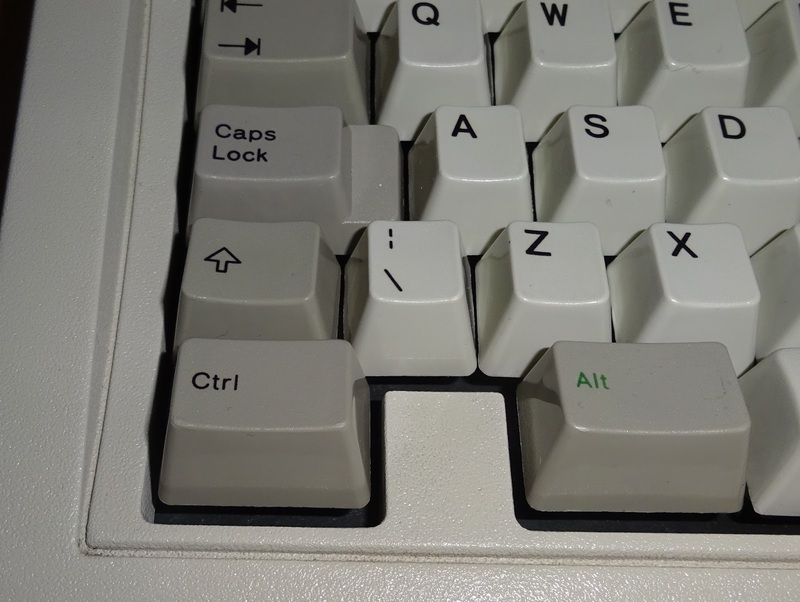 In case you were wondering, hold down right Alt (Alt Gr) or Ctrl and Alt together and press the top left key. 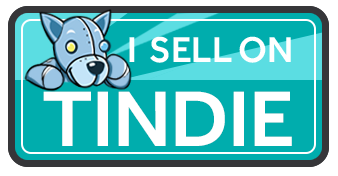 You know, the one above tab with the wrong apostrophe ( ` ) and the weird line with a bit at the end ( ¬ ) that I think is meant to be 'not', although tilde (~) is more often used. OK, you can now forget about that key again. 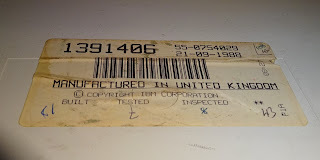 There is a date code on the back, 21-09-1988. I have friends who weren't born when this keyboard was built and now have kids of their own. All in all, a great keyboard. 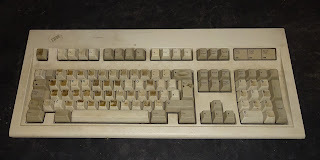 It wipes the floor with modern soft membrane keyboards, and stands up well to modern mechanical gaming keyboards. I do have just about enough bits to make up the second one, once I fix the controller and replace the plastic rivets. I'm sure I'll get around to that one day as these are such nice keyboards to use, I wouldn't change it.